Children's faces light up with joy as they stand in front of a loom. Confronted by this rich medium of expression, the endless artistic possibilities in their sub-conscious minds will soon be able to develop. Many educators recognize the value of free expression for young children. Unfortunately, as Ramses noted, they believe that it disappears of its own accord at puberty, or is out of place in adolescents who should be thinking about exams. "And yet the enjoyment of this freedom," he wrote, "is as important for the adolescent as it is for the child." Here Ramses Wissa Wassef touches on an important point when considering that art as an educational tool can potentially be used for people of all ages; particularly when this type of education is used as a method of freeing individuals from the everyday conventions so often and so forcefully imposed on them. Below, Ramses further explains his ideas and methods of education. 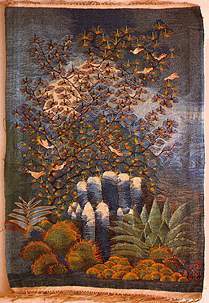 "Weaving is one of the most promising fields of art education. Conventions with regard to perspective and the imitation of reality are less intrusive here than in the fields of sculpture and drawing; it is moreover easier to guard against conventions peculiar to weaving itself, which possesses its own rich and ever-renewable variety of forms, colours and methods of expression. These weavers interpret straight into weaving the images which come to them. The child lives in a world of beauty peculiar to himself. Confidence exalts him and redoubles his enthusiasm; criticism paralyzes and stifles him. He must have freedom: his feelings and the forms they take are dictated by an inner inexhaustable vision which finds expression in a natural sense of values and an authentic harmony. We had no exams at Harrania. In fact, it is even misleading to talk of education. I merely acted as a screen between the army of external influences and the children's own rich natures. By means of direct creative activities, I aroused and protected the free play of spontaneous impulses. The result was a whole new language, an unlimited source of poetry that 'came' to light early and has remained abundant through the years. Far from weakening, the miracle of its incredible vitality has been continually renewed in spite of outside disturbances. It went on through the age of puberty, which we had been led to fear, and even through marriage and adulthood."